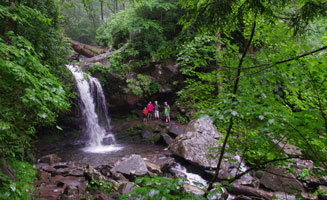 The Smokies offer activities for visitors of various ages and interests. Recommended nature activities include camping, hiking, picnicking, sightseeing, fishing, horseback riding, and nature viewing. There are also opportunities for ranger-guided programs. Great Smoky Mountains National Park is the largest federally protected upland landmass east of the Mississippi. It is also the only free national park! Among the oldest mountains in the world, the Smokies formed perhaps 200-300 million years ago! This mountain range, which is part of the Appalachians, is unique in its northeast to southwest orientation. Species have migrated along these ancient slopes during climactic changes such as the last ice age. Because the Smokies have been relatively undisturbed by glaciers or ocean inundation for over one million years, the species present in this refuge have diversified extensively. With almost ninety-five percent of the national park forested, some 100 species of native trees, as well as over 1,400 flowering plants and at least 4,000 nonflowering plants find homes in the Smokies. The Great Smoky Mountains National Park always offers interesting sites. It is the center of diversity for lungless salamanders and is home to over 200 bird species, 66 types of mammals, 50 native fish species, 39 varieties of reptiles, and 43 species of amphibians. Because of this diversity and the plentiful natural resources these species thrive on, the United Nations considers Great Smoky Mountains National Park to be an International Biosphere Reserve. During wet years, the park recieves over eight feet of rain fall in the high elevations. High humidity during summer months and abundant rainfall make this preserve a temperate rainforest! 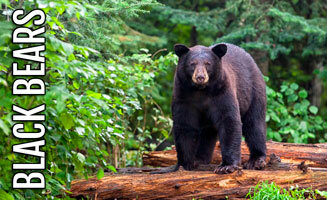 Remember, all animals in the Smokies should be viewed from a distance and left undisturbed. Scan through the following descriptions to see what animals might cross your path while visiting the Smoky Mountains. Black Bears inhabit all areas of the park. DO NOT FEED THE BEARS! It is very important that visitors not feed any animal they encounter in the national park; please realize bear are wild, very strong and agile animals. 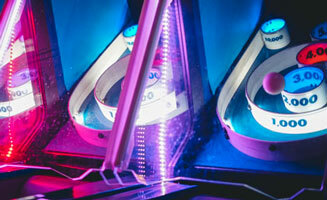 By attempting to approach these creatures, you are risking your safety. Beggar bears that grow accustomed to finding human food live an average of half the lifespan of a healthy, wild bear. These animals face sickness, starvation, and euthanasia if they become dependant on or aggressive toward humans. If you are fortunate and spot a bear while visiting the Smokies, stay at a safe distance (your presence should not disturb the bear’s natural behavior) and make sure to take plenty of pictures to remember your good fortune. Of the nearly two-dozen species of snakes in Great Smoky Mountains National Park, only two are venomous: The Timber Rattlesnake and the Northern Copperhead. Though you’ll occasionally see snakes slinking through the Smokies, a fatal snakebite has never been reported. Twenty three species of snakes live in the national park: Eastern worm snake, Northern scarlet snake, Northern black racer, Northern ring-neck snake, Corn snake, Black rat snake, Eastern hognose snake, Mole kingsnake, Eastern kingsnake, Black kingsnake, Scarlet kingsnake, Eastern milk snake, Northern water snake, Rough green snake, Northern pine snake, Queen snake, Northern brown snake, Midland brown snake, Northern redbelly snake, Southeastern crowned snake, Eastern garter snake, Eastern earth snake, Northern copperhead (venomous), Timber rattlesnake (venomous). White tailed deer are often seen in Cades Cove and the Cataloochee Valley where open fields provide grazing opportunities. Fawns are born in late June and bucks’ antlers develop fully by late August. Scientists estimate that as many as 6,000 dear live within the park. These numbers can change quickly due to sickness. Plan an early morning or evening drive through the Cades Cove loop for your best chance at viewing deer and other animals! Elk can best be viewed in the early morning and late evening times, and may also be very active on a cloudy summer day. It is illegal to knowingly come within 50 yards of an elk, so enjoy them at a distance with binoculars or a scope. Getting too close to an elk may cause them to charge and can result in much harm. If you approach an animal so closely that it stops feeding, changes direction of travel, or otherwise alters its behavior, you are too close! Raccoons are second only to bears for causing disturbances in campgrounds. Also like bears, they learn to beg and can easily starve to death in winter months when scraps run low. Always secure all food and dispose of garbage in designated bins. These masked bandits enjoy stealing shiny objects, so even if it is not edible, consider putting away anything easily grasped in little paws. Raccoons and skunks often contract rabies; please report any animals exhibiting unusual behavior to a park ranger and just because they seem approachable due to their small size, when sick or frightened, they can become very aggressive. Sometimes called the “Salamander Capital of the World”, Smoky Mountains visitors often see these tiny friends while playing in mountain streams or hopping little trickles of water on trails such as Chimney Tops or Rainbow Falls. A salamander’s skin is very delicate; please do not touch these dainty creatures because oils and products on your hands can harm them. Thirty known species of salamanders all live within the park, so keep an eye to the ground & try to spot one of your amazing park hosts! No, you did not see a wolf in the park. Though the National Park Service did attempt to reintroduce red wolves in the Great Smoky Mountains, this project was unsuccessful and the remaining animals were removed. If you saw a wolf-like animal while visiting, it was probably a coyote. These creatures are not native to this area but because of their hardy nature, they continue to spread across the United States. Red and gray fox also live in the park but these specimens are smaller and more timid. To identify a coyote, look for large ears and lanky features. Chipmunks and gray and red squirrels all frequent campgrounds, picnic areas, and most woodlands in the Smokies. Due to illegal feeding, red squirrels are quite tame along the Alum Cave trail. Many hikers stop at an overlook to eat and discover these speedy beggars surround them. Chipmunk, like Chip and Dale are smaller and tend to live on the ground more than squirrels. Easily distinguished by their size and pretty markings, these rodents usually streak through the underbrush along trails. Synchronous Fireflies are very uncommon! Until 1994, it was relatively unknown that these special animals live in the Great Smoky Mountains National Park. At this time, this is the only known species of firefly that can synchronize their flashes in the Americas. Now a very popular attraction during their peak period, two-weeks in mid-June, the fireflies in the Elkmont area of the Smokies performed a “light show”. Due to the massive number of onlookers, traffic and other crowd concerns have become a bit of a problem. If you intend to visit during June, shuttle buses are provided by the city of Gatlinburg and pick up visitors from the Sugarlands Visitor Center. Advance reservations are highly recommended. Book your space at the Recreation.gov website. Also, remember to be polite. Keep your flashlights aimed at the ground while walking, turn them off and remain quiet once you are stationary, and only take out what you brought into this quiet area. Spring and fall in these mountains bring thousands of visitors to view the beautiful wildflowers and spectacular displays of changing leaves. Year round, the hills of East Tennessee reveal amazing flora. The following plants are often seen or searched for in the Smoky Mountains. A tree that most visitors see while exploring the Smoky Mountains is the Eastern Hemlock. A nonnative pest, the Hemlock Woolly Adelgid, now threatens this conifer. The white specs visible in the photograph are this tiny creature. A relative to the Balsam Woolly Adelgid, which has destroyed much of the Fraser Fir population located in the higher elevations of the park, this tiny Asian aphid-like insect fears no native predators. It continues to spread down the eastern coast. Currently, the most promising control for these tiny insects is yet another Asian immigrant: Pseudoscymnus tsugae (Pt), a beetle. Luckily, cold temperatures during Winter 2013-2014 killed most of the hemlock woolly adelgid population. The especially cold winter freeze also slowed the reproductive rate of the invasive species. The University of Tennessee Institute of Agriculture has established a Pt beetle raising laboratory, and our hopes are with them in their success. Mountain Laurel provides hikers with beautiful views of deep green woods with light flowers beginning in early May and continuing through June. Many visitors confuse this shrub with Rhododendron. The simple way to distinguish these two dark green, waxy shrubs is by the size of their leaves. Mountain Laurel is, as a whole, a smaller plant. Its leaves, stature, and flowers are all smaller than Rhododendron, but the largest difference is visible in the leaves. The Rhododendron found in the Great Smoky Mountains begins to bloom in June; Rosebay Rhododendron can still be found at mid elevations in July. Rhododendron has larger flowers that range from darker shades of pink to white. If you see a large shrub with colorful blooms, you can assume it is rhododendron of one variety or another. Flame azalea, yet another spectacular site in the Smokies, blooms at lower and mid elevations in April and May and can be seen at higher elevations such as Gregory Bald or Andrews Bald in late June and early July. Spring wildflowers such as trillium, lady slippers, dwarf iris, jack-in-the-pulpit, and countless others begin appearing in early spring in order to beat the summer foliage which shades the ground throughout most of the year. No matter what season you visit the park, be prepared for a colorful display of flowers and trees! A small wildflower book, purchased before your visit or in the bookstore at Sugarlands Visitor Center, is sure to help you with viewing locations as well as identification. Fall brings with it a spectactular display of fall foliage colors. With the changing of yellow birch, American beech, mountain maple, hobblebush, and pin cherry in September, on to the sugar maple, scarlet oak, sweetgum, red maple, and the hickories in Mid-October to November. Some areas are better for viewing the fall colors and they will most likeley be the busiest. Spots like Cades Cove and Newfound Gap Road get especially busy this time of year due to their beautiful views and will most likely experience traffic delays. The Great Smoky Mountains National Park welcomes visitors with a myriad of breathtaking sites. From fascinating animals to beautiful wildflowers, you must plan some time for a visit in the mountains as part of your Pigeon Forge vacation!